You won’t find a drop of dairy in our Healthy Mashed Potatoes & Gravy with Cannellini Cream – not one drop. And if we hadn’t mentioned that this comfort food combo is one hundred percent dairy-free and gluten-free, you’d never have guessed! 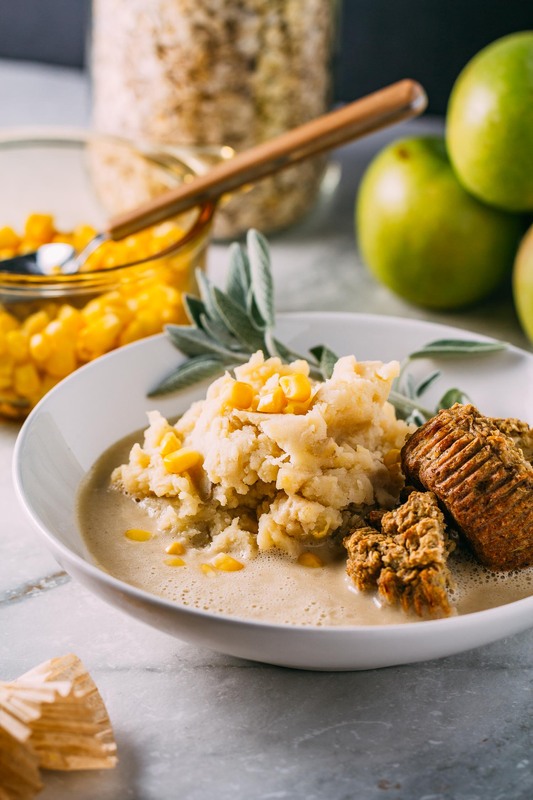 Let’s take a closer look at the mashed potatoes in this Healthy Mashed Potatoes & Gravy with Cannellini Cream pairing. How is it that they turn out so remarkably creamy and taste unbelievably good without the use of unhealthy fat-laden butter and milk? Cook the potatoes in vegetable broth so that they absorb maximum flavor. Add a little sea salt to the cooking broth – flavors become deeper when we season food as it cooks. Now, put garlic to good use. Add a couple of cloves of garlic to the potatoes and broth while they cook to infuse even more flavor. A homemade puree of cannellini beans and unsweetened plant-based milk replace the heavy cream and butter. These far healthier choices provide the same creamy effect of dairy while adding nutrients instead of empty calories. And now, let’s take a closer look at the refined oil-free gravy. How is it that this gravy manages to turn out incredibly creamy and taste so rich without the use of unhealthy fat-laden butter and milk? Sautee the celery and onion in a little water to develop base flavor. Next, create an old-fashioned roux by sprinkling the celery and onion with brown rice flour, sea salt, and pepper. Blend tahini and veggie broth and then added a little at a time to develop the roux. Carefully blend the roux with an immersion blender to rid it of any clumps and create a silky texture. Use fresh sage and lemon juice to finish off the seasoning for this gravy. These key ingredients elevate all of the flavors. So, as you can see, we could talk all day about all of the flavors we’ve experienced throughout our years of developing these simple basics. But rather than boring you with every last detail of every taste and lesson, we kept it simple. That’s why we boiled it down to these two handy lists of necessary steps. 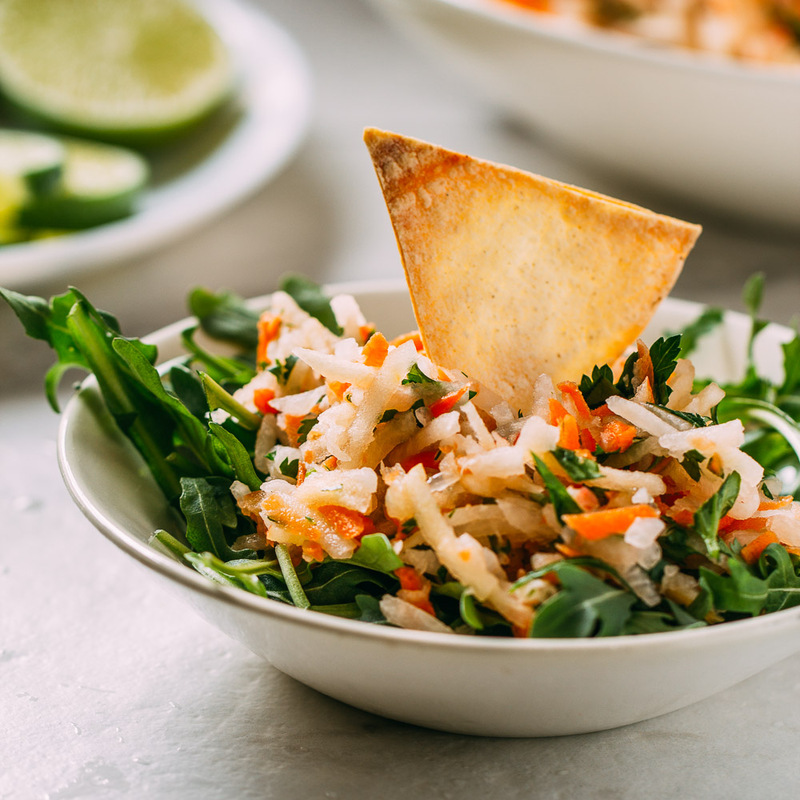 These timeless methods provide everything you need to get cooking deliciousness in your home kitchen this very minute. And you’ll find all of the details in the recipe below to make yourself a satisfying batch of Healthy Mashed Potatoes & Gravy with Cannellini Cream. 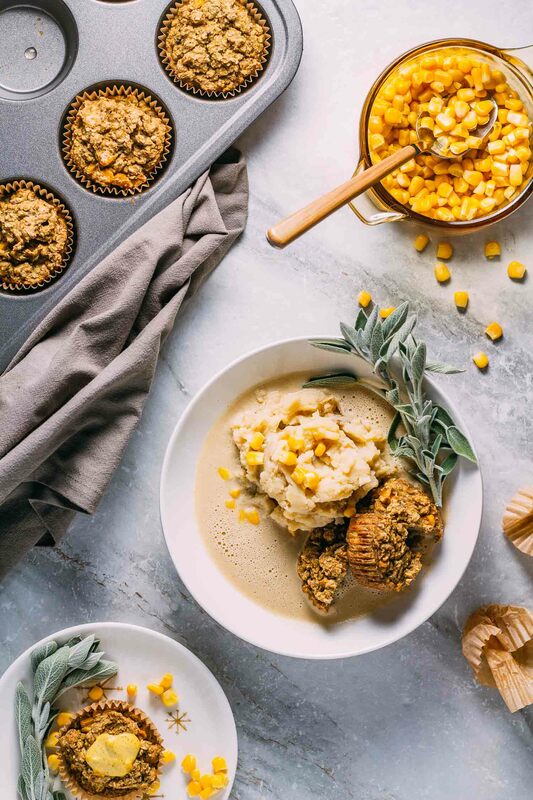 Be sure to try our recipe for, naturally gluten-free, Southern Style Stuffing Muffins when you whip up this batch of Healthy Mashed Potatoes & Gravy with Cannellini Cream. This trio served together in the same bowl reminds us of a comforting hug wrapped in a wealth of holiday flavors. It’s like enjoying all of your favorite Thanksgiving or Christmas leftovers any day of the year, except it’s fresh! The photos of Healthy Mashed Potatoes & Gravy with Cannellini Cream sure do make us hungry! How about you? 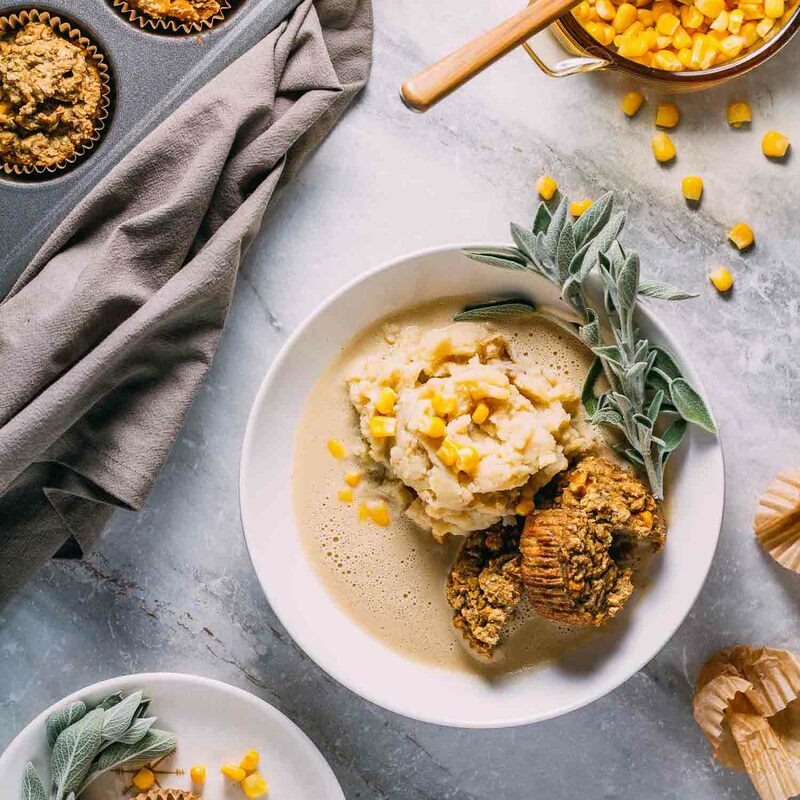 You’ll want to be sure to make a batch of naturally gluten-free, Southern Style Stuffing Muffins whenever you make these nutrient-packed Healthy Mashed Potatoes & Gravy with Cannellini Cream. And another dish you might enjoy these potatoes and gravy with is our Veggie Loving Sheep’s Pie. We think these mashed potatoes would work as well as our Protein-Packed Mashed Potatoes as a topping for our Sheep’s Pie. For the mashed potatoes: 3 lbs of raw potatoes, washed and chopped for cooking - We enjoy a variety of potato called "gold," and we use organic vegetables whenever possible to avoid pesticides. 3 to 4 cups of organic vegetable broth or filtered water - We repurpose this potato cooking broth for use in the gravy. 1 cup of unsweetened plant-based milk - We used plain, unsweetened almond milk. 2 tbsp of brown rice flour, or another gluten-free flour of choice - Note that we achieved smooth results using this organic brown rice flour. 3 tbsp of tahini - We enjoy using this organic brand of tahini because it is easy to stir and pourable. 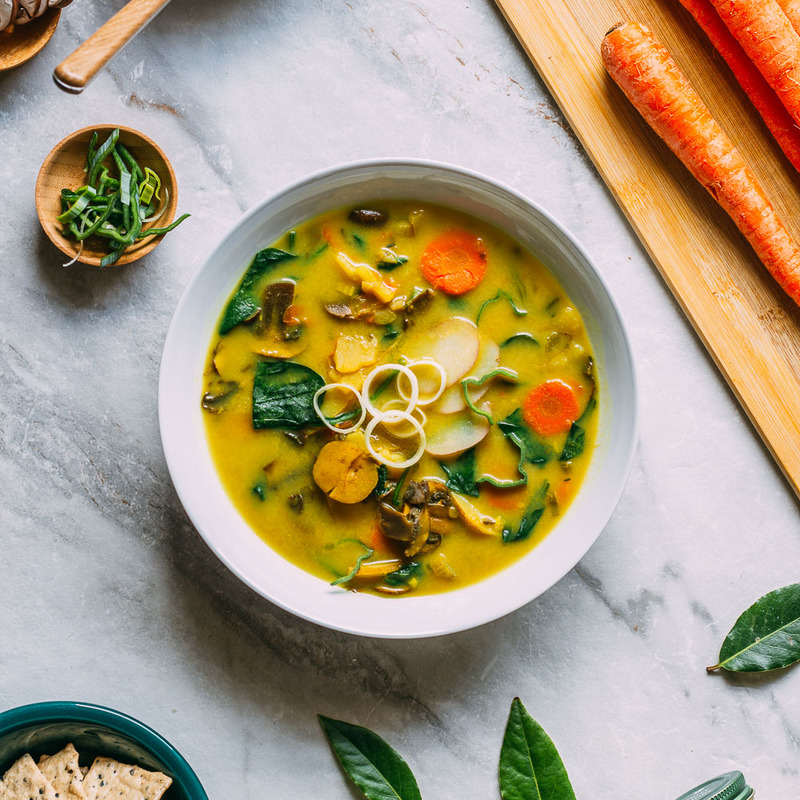 4 cups of vegetable broth - Use the leftover cooking liquid from the drained potatoes and then add more vegetable broth to equal about four cups total. In a large-size lidded saucepan place the prepared potatoes, vegetable broth, salt, and sliced garlic. Cook on medium-high heat and bring to a boil, stir it, reduce the heat to a low boil or hard simmer, partially covering the pot with the lid and cook for about 20 minutes or until fork-tender. We like to prepare our potatoes in vegetable broth so that they absorb maximum flavor. And we add a little sea salt to the cooking broth - flavors become deeper when we season food as it cooks. We put garlic to good use by adding a couple of cloves to the potatoes and broth as they simmer to infuse even more flavor. While the potatoes simmer, in a food processor or high-speed blender, combined the drained cannellini beans and the unsweetened plant-based milk until the mixture is smooth. Set aside to mash into the cooked and drained potatoes they're tender. A homemade puree of cannellini beans and unsweetened plant-based milk replace the heavy cream and butter. These far healthier choices provide the same creamy effect of dairy while adding nutrients instead of empty calories. Using a colander, drain the cooked potatoes while carefully reserving the cooking broth for the gravy. Add the cooked potatoes back to the large saucepan used to cook them. If you prefer, you could also transfer the potatoes to a mixing bowl, but we like to use the heat of the cooking pan to keep the potatoes warm. Next, add a little bit of the cannellini cream mixture to the potatoes at a time and mashed the potatoes with a hand-held masher. Taste and season with salt and pepper accordingly. If you've cooked and drained a full three pounds of potatoes, you'll likely use all of the bean cream while mashing, depending on how creamy you prefer your mashed potatoes. Cover the mashed potatoes and set aside while you make the gravy. For the gravy, begin by sauteeing the onion and celery in a bit of water over medium-high heat in a medium-size skillet or saucepan. Stir and add water as needed to avoid sticking. Ideally, we use a seasoned iron skillet because of how beautifully it cooks the rice flour in the next step, though any pan will do. Sauteeing the celery and onion in a little water develops a base flavor for your gravy. At this point, as the veggies cook, blend the veggie broth with the tahini in a high-speed blender. Remember to use the leftover cooking broth from the potatoes, combined with additional veggie broth, to equal four cups total. This tahini and veggie broth mixture added a little at a time to the veggies, develops the sauce flavor base. Next, sprinkle the wilted onion and celery with the fresh sage and brown rice flour, salt, and pepper, cooking while stirring to distribute each among the veggies thoroughly. As the mixture becomes dry, mix in small amounts of the blended tahini broth at a time. The heat should be medium-high at this point; we mention this just in case you have turned the heat on the veggies down. Continue cooking and stirring and adding the tahini broth until every drop is incorporated. You create a roux when you sprinkle the celery and onion with brown rice flour, sage, sea salt, and pepper. Using an immersion blender if you have one, or by carefully transferring to a high-speed blender, blend the gravy until smooth. After mixing, add the lemon juice a bit at a time and taste to season along with salt and pepper. Everyone's taste is different, but we like our gravy a little peppery, and we use all of the lemon juice. Carefully blending the roux with an immersion blender rids it of any clumps and creates a silky smooth texture. And using fresh sage and lemon juice to finish off the seasoning elevates every flavor. Serve your Healthy Mashed Potatoes & Gravy with Cannellini Bean Cream as sides to accompany holiday meals or any meal where you want to add some homemade comfort. 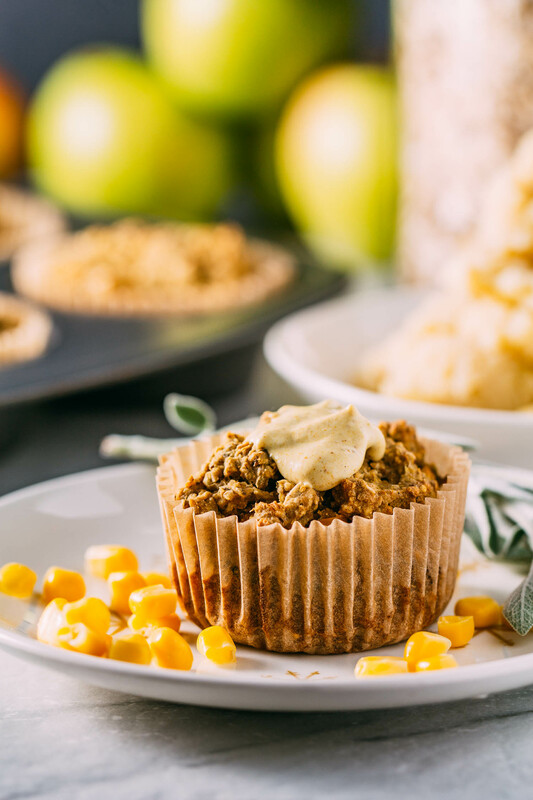 We highly recommend trying this recipe as a holiday bowl by adding a batch of our gluten-free, mouth-watering, Southern Style Stuffing Muffins to your menu. 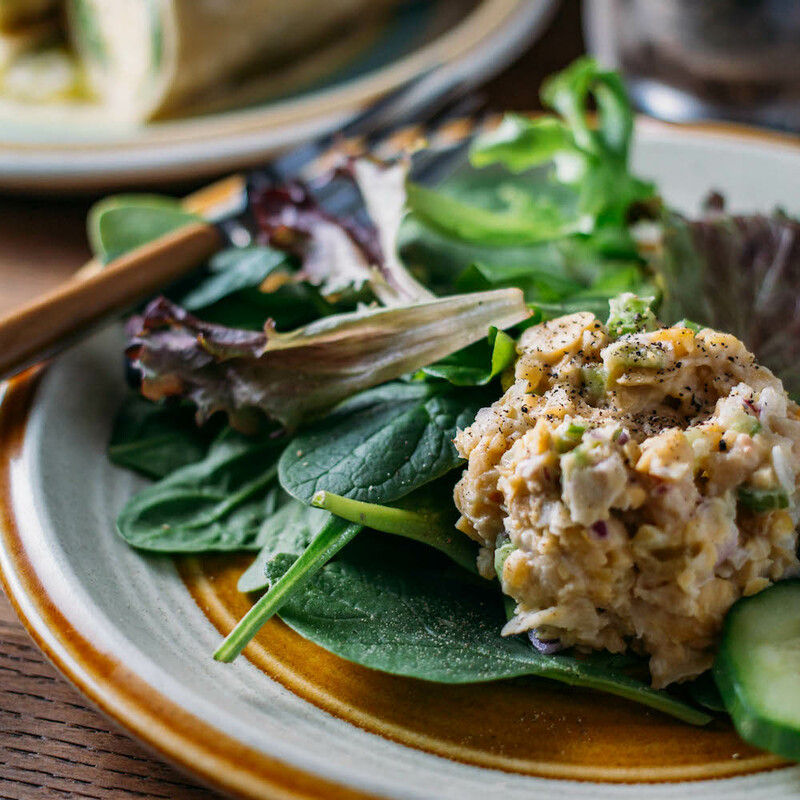 This combo is a perfect way to give yourself comfort food without the unwanted fat that usually accompanies comfort food dishes. If you do not have an immersion blender, high-speed blender or food processor, do not let that stop you from trying these Healthy Mashed Potatoes & Gravy with Cannellini Bean Cream. All of the steps can be achieved without these handy tools through the gravy may have a few veggie lumps, which is no biggie. If you ever find yourself in the market for a high-speed blender, we purchased ours refurbished and have been very pleased.